I have been slowly working my way through the Newberry Award winners from the past 5 years, per my Reading Goal. More slowly than I had anticipated, but hey--it happens. 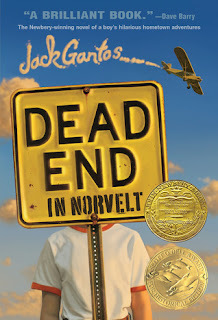 This time around, I had already read (and reviewed) the actual award winner--Dead End in Norvelt--then discovered there was a book continuing the story. I found the second and didn't like it nearly as much as the first. So if you want my advice--which of course you do, right?--read the first and take a pass on the second. You won't miss much. Maybe I'm getting jaded, or maybe I just don't read very humorous books, but it has been a long time since I have laughed out loud while reading. An occasional chuckle perhaps, but that's about it. This one had me laughing multiple times, causing my husband to give me the "are you okay over there" look and my kids to beg me to explain what was so funny. Guess you just had to be there. 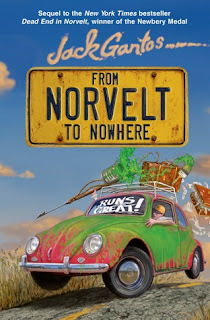 As far as giving it the Newberry--I don't know that it had the depth to really deserve that award, but maybe they just wanted a book to win that would really appeal to boys...and their moms. I guess. In any case, I enjoyed it. 2 stars: This one was a bit off. 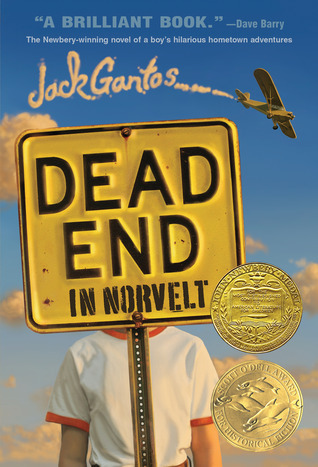 Jack somehow gets swept along on a crazy road trip, with his old-lady neighbor Ms. Volker. She's after a murderer, or so she says, and apparently there's a few people after her too. Also, Ms. Volker has a gun. Jack isn't sure what to think, except that he should stop anybody from killing anybody else. If he can. I really liked Dead End in Norvelt, and my oldest son liked it too, when he read it a couple of months ago. This one....I steered him away from it. Not that there's content issues, per se, but there's kind of a weird vibe going on between Jack and Ms. Volker. In some places he's coming on to her and in other situations she's coming on to him. I mean, she's old enough to be his grandma. It was unsettling and just strange. Pretty much the whole time Jack is certain that Ms. Volker has lost her mind. She certainly acts like it. Is it all an act? Maybe Gantos did too good a job of convincing me along the way, because when she makes a turn-around, that's when I stopped believing. Maybe she just started taking her meds or something, I don't know. Then there's the whole issue of the trip in the first place. So, Jack's parents were okay with him escorting her on her trip. Okay, I guess. I'll go along with that--it was a train ride to Grand Central Station. Not much could go wrong there, right? However, when it turned into several-thousand-mile road trip and they were still just fine with it all? Um...no, not so much. "Have fun stormin' the castle, Jack, and be sure to buckle up since you're still TOO YOUNG TO DRIVE!" Just no. I didn't find it nearly as funny as the first. More like disjointed, a bit manic, and strange. What books have you read where the sequel is as good as the first in the series? I keep thinking it must be hard to write a sequel, because there are so many that fall flat.